Companies often prepare their employees for emergencies such as natural disasters, weather events or fires with outlined procedures and training in order to minimize damage and ensure safety. When it comes to cybersecurity, businesses often overlook the potential for serious harm to occur from a data breach. 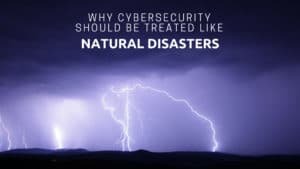 This ultimately leaves employees uninformed and unprepared for a cyber disaster to occur. According to World Economic Forum, each year the Global Risks Report works with experts and decision-makers across the world to identify and analyze the most pressing risks that we face. The report for 2018 shows a strong indication that the threat of cyber attacks will cause just as much disruption to society as natural disasters within the next five years. When cloud technology is not implemented or used properly within businesses, this creates a large target for cybercriminals to steal valuable information. With expanded use of the Internet to store information, there were an estimated 8.4 billion devices in use in 2017, and by 2020 it is projected that 20.4 billion devices will be connected to the Internet, according to ZDNet. Businesses can install off-site backup to keep data safe and secure in case something happens to the mainframe or data collection tools. A common misconception is that implementing off-site backup can be costly. MDL Technology charges no initial hardware or software costs, which makes disaster recovery an affordable, viable option. There are many options for payment that fit your budget and allow for a better state of mind when it comes to the protection and backup of your data. To learn more about disaster recovery and using off-site backup, visit MDL Technology’s services page.